Forest Garden 8 x 10 Premium Tongue and Groove Pressure Treated Apex Shed: This Forest Garden 8 x 10 premium tongue and groove shed combines excellent quality with long lasting durability. All the window and door fittings with the premium range are stainless steel for a rust resistant finish and the shed includes added security features such as hidden hinges, a rimlock door latch consisting of lock, keys and door handle. The windows are glazed with premium acrylic and the double door has double Z framing to give it added strength and durability. This garden shed will be delivered in easy to manage sections which are simple to assemble using the included assembly guide. 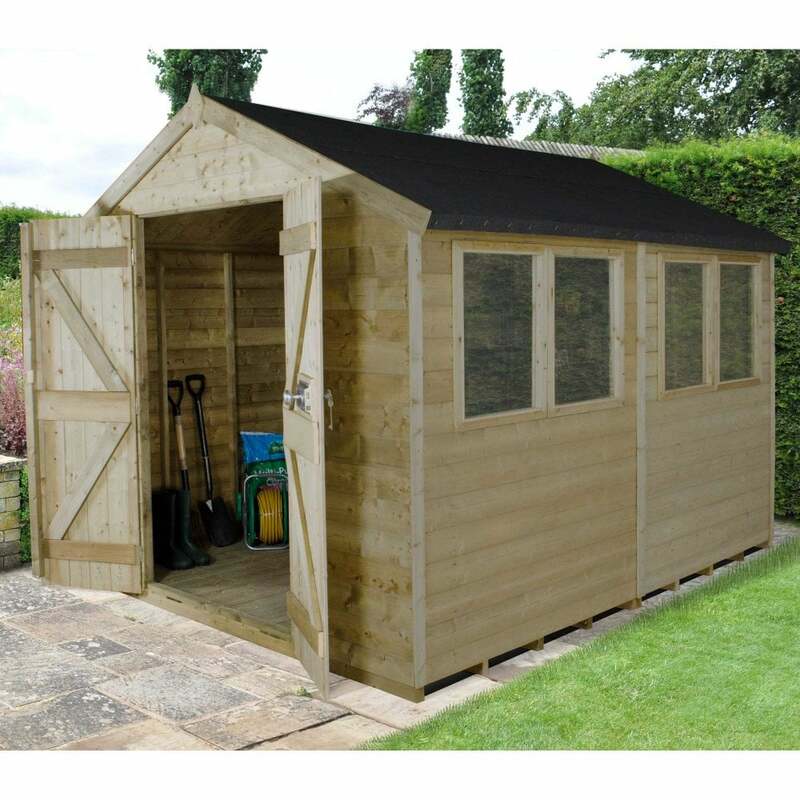 This shed has excellent quality tongue and groove construction meaning that the boards are tight fitting to protect the shed from the wind and rain. The wood is pressure treated in the factory for a long lasting finish and is guaranteed against rot and fungal decay for 15 years. The floor of this building is made from tongue and groove boards that are also pressure treated for a longer life expectancy. The roof is also made from tongue and groove boards which are covered by the included shed felt for a waterproof finish.